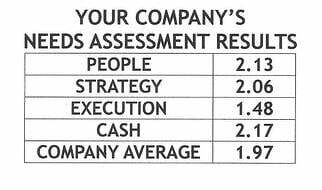 Every year at annual planning and strategy meetings, as Gazelles/Rockefeller Habits coaches, we ask our leadership teams to assess what the top 3-5 Strengths, Weaknesses, Opportunities and Threats for your company are at this point in time. Take a look at this visual matrix, there are two variables: On the left side, the origin of the SWOT you see attributes that come from within the company or from external influence; and on the top of the matrix, attributes that are helpful to the company’s growth and those that can be harmful. The resulting intersection of each attribute creates the unique set of Strengths, Weaknesses, Opportunities and Threats for a company’s foundation. A weakness is internal and usually unlikely to change. That’s because a weakness is often the opposite of your strengths. An example might be your business is not good at documenting systems. This is something you can change if you really want to. Therefore not having documented systems is an opportunity not a threat. A weakness is more likely to be the opposite of great customer service or pricing. If you charge for your product or service a weakness might be not having low pricing. Each year, the middle management team – those that execute the day-to-day business – should conduct a thorough SWOT analysis using a rigorous, yet efficient, process. We recommend using an outside facilitator (Coach) to ensure full, balanced sharing and conclude with the middle management team providing an executive briefing of their outcomes to the senior leadership team. This is a vital step in a successful annual planning process for any company and certainly required for a growth company. 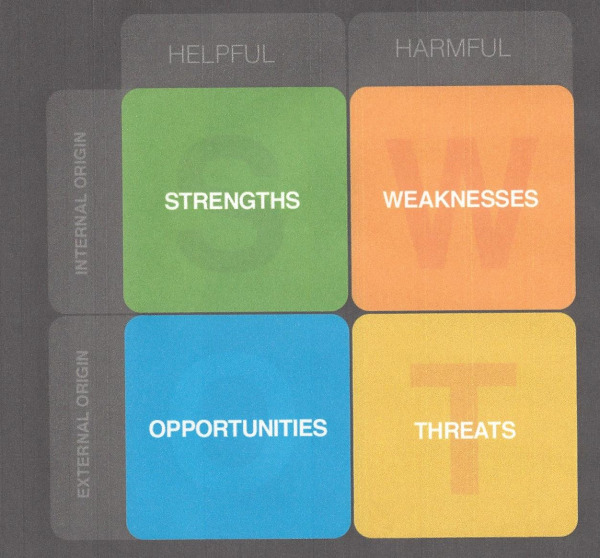 While SWOT analysis comes from within the middle management team – those executing the day-to-day operations of the business – the Strengths, Weaknesses, Trends (SWT) analysis is to be conducted by the senior leadership team and connects to “Strategic Thinking” and planning for the business. This should be at least a recurring benchmark in every annual strategy and planning session. The SWT has both similarities and yet is distinctive from the SWOT. The SWT is conducted by the senior leadership team as they build the foundation for the One-Page Plan. Strengths – which reflect the Core Competencies of the company: the inherent sources of success through time. Weaknesses – which are inherent to the company and are highly unlikely to change through time. Trends – Forces from outside the company that will have influence on the company’s long-term direction, health and sustainability. 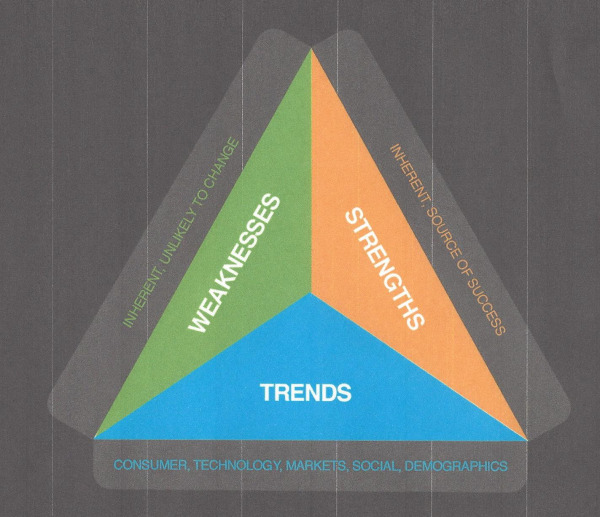 Trends include consumers, technology, market dynamics, social influence, and finally demographics. If you’ve not completed this in the past it may require some adjustment and mental preparation. The reality is that trends may be more important than the traditional Strengths, Weaknesses, Opportunities and Threats. Witness the demise of many heralded company’s like Kodak, Blockbuster, Kmart, Sears, etc., Read Think Your Business Couldn't End Up Like Kodak? Think Again from January 24th, 2012 if you still are skeptic. In Disruptive Innovation: The Exponential Organization author Salim Ismail noted, the lifespan of S&P 500 company, at one time, was 67 years. That has dropped to 15 years. What’s remarkable is that in the 9 months that it took for Salim to write his book that number has dropped to just 12 years. What trends and disruptive innovations have caused these changes to occur? What trends are emerging in your industry? How might they impact the way you do business in the coming year and beyond? Do you examine this at all? Are you aware that technology and Big Data are disrupting how all business conduct work and that if not presently affecting your business or industry you can count on this disruptive innovation to jar your company and industry soon. Meeting with one of my customers in the Home Remodeling business he struggled to identify trends in his industry. We discussed how HGTV has made a visual look and feel of the remodeling project a prerequisite for closing business. While his company has fully embraced this trend already and shows potential customers a 3-D depiction of the work they will provide, he noted that most customers are surprised and even unaware this technology exists. That’s not a reason to not be equipped to use it. I asked him if a competitor of his had this. He didn’t how it might affect whether or not the customer would do business with them. The key to this exercise is recognizing that trends are critical to be aware of. The number one function of leadership is prediction, failure to anticipate trends speaks volumes about this aspect of your leadership. If you are to have control or demonstrate any leadership of your business forecasting/prediction is a demand you absolutely need to satisfy. 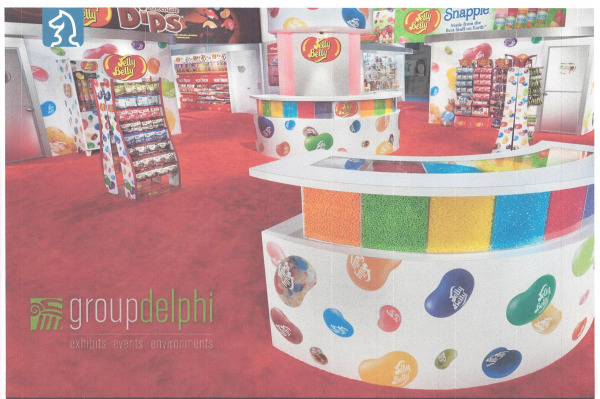 Group Delphi is a leading trade show and event services company in the San Francisco Bay Area. They do business throughout the United States. At a their regularly-scheduled, two-day annual planning session, a facilitated Strengths, Weaknesses, Trends collaborative analysis was conducted and a rich list of 10 or more Strengths, Weakness and Trends were documented (in each area). In the collaborative process, it was discovered and clarified that the Tradeshow Events industry in the United States is coming into its centennial era: there were companies on the brink of being 100 years old in the industry. As the dialogue matured (trends) it was hypothesized that there would be several mature companies whose owners, multi-generational families, who would be interested in exiting their businesses. This discussion lead to the development and clarification of an organic growth (through internal sales growth) and inorganic growth (through “win-win” acquisitions) strategy: Group Delphi could provide an exit strategy for tired or ready-to-exit owners of smaller, multi-decade companies in the industry. Since this discussion occurred just three years ago, Group Delphi has successfully acquired 3 companies in the industry as they build toward their 3-5 year revenue milestone. What trends will affect your business? Which will influence your business positively and which could possibly fetter your growth? Have you completed a SWT for your business for 2015? Google recently completed a management study in an attempt to discover what makes a better boss. We’ve built this into our new Rockefeller Habits IP we share with our customers and I’ll provide you a sneak peek on what the #1 key, in employee’s minds, is to being considered an effective, successful manager. That’s next blog.